Grundy Productions / Seven Network. 972 x 30mins. 1982-1987. Producers: Don Battye, Reg Watson. 45 (ST)	RCA. 103927. 1981. Arranged and Produced by Mike Harvey. Grundy Organisation Pty. Ltd.
Side a: “Sons And Daughters (3/4 Version)”. (3:04). (Peter Pinne - Don Battye). (Control). v: Kerri Biddell & Mick Leyton. Side b: “Sons And Daughters (4/4 Version)”. (3:33). (Peter Pinne - Don Battye). (Control). 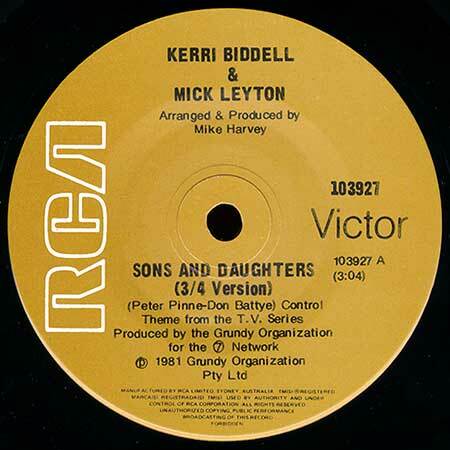 v: Kerri Biddell & Mick Leyton. (For Side 2 details see - COUNTRY PRACTICE, A:). Sons & Daughters Theme. (Peter Pinne - Don Battye). (Calcine). Some Kind Of Friend. (Manilow - Anderson). (Chappell). v: Ian Rawlings. Bosom Buddies. (Jerry, Herman). (Nonis). v: Pat MacDonald, Rowena Wallace. The More I See You. (Gordon - Warren). (Chappell). v: Peter Phelps, Kim Lewis. Behind Closed Doors. (O’Dell). (House Of Gold). v: Thomas Richards, Leila Hayes. Sometimes When We Touch. ( Hill - Mann). (Castle). v: Steven Comey. Help Me Make It Through The Night. (K. Christopherson). (Festival). v: Leila Hayes. Friends. (Klingman, Linhart). (Intersong). v: Rowena Wallace. LP(t) (AD)	Towerbell (UK). TVLP 3. 1985. “THE TV HITS ALBUM”. S2-Tk3 “Sons & Daughters Theme”. (Peter Pinne - Don Battye). v: Kerri & Mick. Bocu Music Ltd. Arranged & Produced by Mike Harvey. 1981 Grundy Org. Pty. 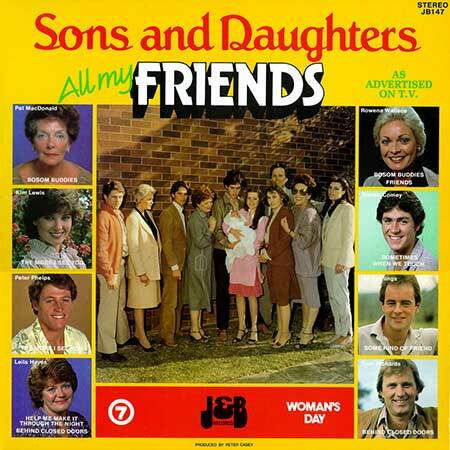 Ltd.
LP(t) (ST)	(See COMPILATIONS - AUSTRALIAN TV’s GREATEST HITS: S1-Tk2). LP(t) (ST)	(See COMPILATIONS - T.V. TUNES - 50 OF TV’s GREATEST THEMES: S1-Tk13). 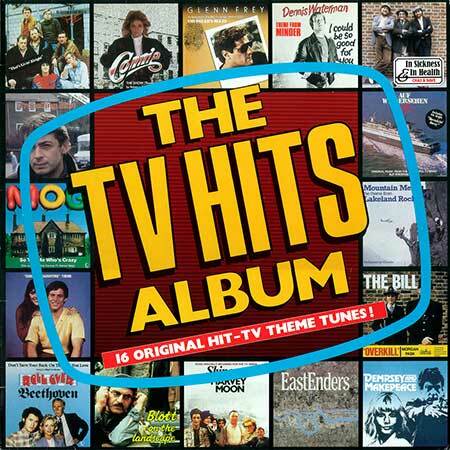 CD(t) (AD)	(See COMPILATIONS - TOP TV SOAP THEMES: Tk14).